Missing values commonly occur in the microarray data, which usually contain more than 5% missing values with up to 90% of genes affected. Inaccurate missing value estimation results in reducing the power of downstream microarray data analyses. Many types of methods have been developed to estimate missing values. Among them, the regression-based methods are very popular and have been shown to perform better than the other types of methods in many testing microarray datasets. To further improve the performances of the regression-based methods, we propose shrinkage regression-based methods. Our methods take the advantage of the correlation structure in the microarray data and select similar genes for the target gene by Pearson correlation coefficients. Besides, our methods incorporate the least squares principle, utilize a shrinkage estimation approach to adjust the coefficients of the regression model, and then use the new coefficients to estimate missing values. Simulation results show that the proposed methods provide more accurate missing value estimation in six testing microarray datasets than the existing regression-based methods do. Imputation of missing values is a very important aspect of microarray data analyses because most of the downstream analyses require a complete dataset. Therefore, exploring accurate and efficient methods for estimating missing values has become an essential issue. Since our proposed shrinkage regression-based methods can provide accurate missing value estimation, they are competitive alternatives to the existing regression-based methods. Nowadays microarray technique has become an important and useful tool in functional genomics research. This high throughput technique allows the characterization of the gene expression of the whole genome by measuring the relative transcript levels of thousands of genes in various experimental conditions or time points . Microarray data analyses have been widely used to investigate various biological processes such as the cell cycle process [2–8] and the stress response [9, 10]. Although the microarray technology has been developed for more than a decade, typical microarray data still contain more than 5% missing values with up to 90% of genes affected . Missing values could be generated by various reasons, including technological failures, administrative error, insufficient resolution, image corruption, dust or scratches on the slide . As many downstream analysis methods (such as gene clustering, disease classification and gene network reconstruction) require complete datasets, missing value estimation becomes an important pre-processing step in the microarray data analysis [11–13]. The missing values in the microarray dataset are traditionally estimated by repeating the microarray experiments or simply replacing the missing values with zero or the row average (the average expression over the experimental conditions). Because these approaches are either time-consuming or leading to serious estimation errors, more advanced missing value imputation methods are needed to solve the missing value problems. In 2001, Troyanskaya et al. published the first two missing value imputation algorithms based on the k-nearest neighbors (kNNimpute) and the singular value decomposition (SVDimpute) . Since then, a lot of missing value imputation methods have been proposed such as Bayesian principal component analysis (BPCA) , Gaussian mixture clustering imputation (GMCimpute) , conditional ordered list imputation , random-forest-based imputation  and so on. Among the existing missing value imputation methods, the regression-based methods are very popular and contain many algorithms, including least squares imputation (LSimpute) , local least squares imputation (LLSimpute) , sequential local least squares imputation (SLLSimpute) , and iterated local least squares imputation (ILLSimpute) . LSimpute estimates the missing values in the target gene by using a weighted average of the k estimates from the k most similar genes. Each estimate is attained by constructing a single regression model of the target gene by a similar gene. LLSimpute represents the target gene as a linear combination of k similar genes by a multiple regression model and uses the regression coefficients to estimate the missing values. SLLSimpute modifies the LLSimpute by estimating the missing values sequentially from the gene containing the fewest missing values and partially utilizing these estimated values. ILLSimpute modifies the LLSimpute by not choosing the similar genes with a fixed number k but defining the similar genes as the genes whose distances from the target gene are less than a distance threshold and then runs LLSimpute iteratively. 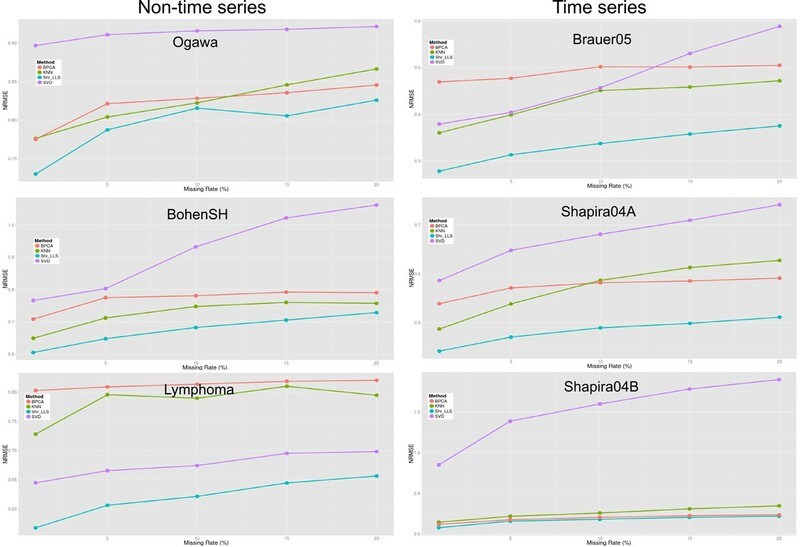 In this study, we focus on the regression-based methods because these methods have been shown to have better performances than the other existing methods in many testing microarray datasets [20, 21]. To further improve the performance of the regression-based methods, we propose shrinkage regression-based methods which use a shrinkage estimator to replace the least square estimator for the estimation of the regression coefficients in the regression model. The shrinkage estimator such as the James-Stein estimator has been shown to dominate the least square estimator in many statistical models [22, 23]. By adopting our new regression coefficients in the regression-based methods, we showed that an improvement on missing value estimation in six testing microarray datasets could be achieved. 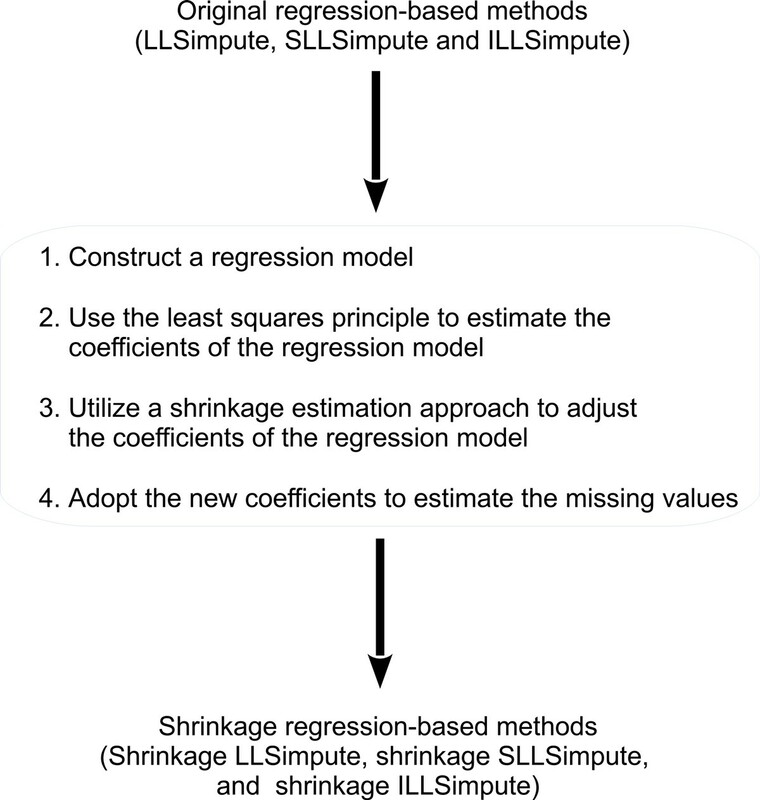 In this study, we propose using the well-known shrinkage estimation approach to improve three existing regression-based methods (LLSimpute , SLLSimpute , and ILLSimpute ) for missing value estimation. We call our proposed methods the shrinkage regression-based methods (see Figure 1). In the following subsections, we first introduce the shrinkage estimation approach and then describe the proposed shrinkage LLSimpute, shrinkage SLLSimpute, and shrinkage ILLSimpute. θ ^ i J S = 1 - k - 2 S Y 2 Y i .
all have uniformly smaller mean squared error than the intuitive estimator Y i , for k ≥ 3 and 0 <c < 2 (k - 2). Among all the estimators of the form in (4), the estimator in (3) has the minimized mean squared error. The shrinkage estimation approach has also been shown to have good performance in interval estimation [24, 25]. Based on the James-Stein estimator in (3), we developed shrinkage regression-based imputation methods. where g i T denotes the transpose of a column vector g i . If there is a missing value in the l th position of the i th gene, we denote it as α , i.e. G i , l = g il = α .
min x A T x - w 2 .
x ^ ≜ ( x ^ 1 , x ^ 2 , … , x ^ k ) T = ( A A T ) - 1 A w .
α = b T x ^ = x ^ 1 b 1 + x ^ 2 b 2 + … + x ^ k b k .
where x ^ J S = ( x ^ 1 J S , … , x ^ k J S ) T .
By a similar argument as for the shrinkage LLSimpute, we apply the shrinkage estimator to SLLSimpute. The shrinkage SLLSimpute adjusts the coefficients of the regression model by the formula in (10) and use the formula in (11) to estimate the missing values. LLSimpute and SLLSimpute methods select k-nearest neighbor genes for a target gene, where k is a fixed number. However, in the ILLSimpute method , it does not fix the number of similar genes selected. Alternatively, it defines the similar genes as the genes whose distances to the target genes are less than a distance threshold δ . The rationale of using a distance threshold rather than using a fixed number of similar genes is that some of the k-nearest neighbor genes are already far away from the target gene and are not very similar to the target gene. The procedure of ILLSimpute is as follows. In the first iteration, missing values of each target gene are filled with the row average. Then a distance threshold δ is used to select the similar genes of each target gene. Finally, LLSimpute method is used to estimate the missing values of each target gene. In the later iteration, ILLSimpute method uses the imputed results from the previous iteration to reselect the similar genes of each target gene (using the same distance threshold) and applies LLSimpute method to re-estimate the missing values. By a similar argument as for the shrinkage LLSimpute, we apply the shrinkage estimator to ILLSimpute. The shrinkage ILLSimpute adjusts the coefficients of the regression model by the formula in (10) and use the formula in (11) to estimate the missing values. We conducted several experiments to compare the performances of our shrinkage regression-based methods and the original regression-based methods under different scenarios. In the first subsection, we introduce the benchmark datasets. In the second subsection, we describe how we measure the performance of various imputation methods. In the following three subsections, we report the comparison results for different number of similar genes used, different missing rates, and different noise levels. Finally, we further compare the performances of our shrinkage regressioni-based methods and three existing non-regression-based methods. Considering the effects of dataset selection and types of microarray experiments on the performance of an imputation method, six representative datasets (three non-time series and three time series) were used in our simulations. They were Ogawa's data from the study of phosphophate accumulation and poly-phosphophate metabolism (denoted as Ogawa, non-time series) , Bohen's follicular lymphomas data (denoted as BohenSH, non-time series) , the data from a lymphoma study (denoted as Lymphoma, non-time series) , the data from Brauer's experiments which studied the physiological response to glucose limitation in batch and steady-state cultures of yeasts (denoted as Brauer05, time series) , and Shapira's oxidative stress data (denoted as Shapira04A and Shapira04B, time series) . We divided Shapira's data into two datasets because the authors used one kind of oxidative chemical in the experiment in Shapira04A, but they used another kind of oxidative chemical in the experiment in Shapira04B. The six microarray datasets were used as benchmark datasets in numerical experiments to compare the performances of our shrinkage regression-based methods and the original regression-based methods. Each dataset was processed by deleting the genes with missing values to generate a complete data matrix, and the details of these datasets were listed in Table 1.
where yguess and yans are vectors whose elements are the estimated values by an imputation method and the known answers for all missing entries, respectively. A parameter k, the number of similar genes used, has to be determined before using two regression-based methods (LLSimpute and SLLSimpute). Since the performance of both algorithms is known to be affected by the k value used and different microarray datasets may have different optimal k values [18, 19], we tested several possible k values (50, 100, 150, 200, 250 and 300) on six benchmark datasets. Table 2 listed the optimal k values for LLSimpute and SLLSimpute on each of the six benchmark datasets. Another regression-based method (ILLSimpute) does not have the parameter k and therefore was not considered in this numerical experiment. The optimal k value for each benchmark dataset. For each of the six benchmark dataset, we also compared the performances of the proposed shrinkage regression-based methods and the original regression-based methods for several possible k values (50, 100, 150, 200, 250 and 300). In our numerical experiments, missing rate for each benchmark dataset was set to be 5%. Namely, for each dataset, we randomly removed 5% entries of the complete matrix to generate a matrix with missing values, and then estimated the missing values using the shrinkage and the original regression-based methods. The same procedure was run for five independent rounds and the average NRMSE of these five simulations was used to compare the performances of different imputation methods. As shown in Figure 2, the proposed shrinkage LLSimpute outperforms LLSimpute for all k values and all benchmark datasets. Similarly, the proposed shrinkage SLLSimpute outperforms SLLSimpute for all k values and all benchmark datasets (see Figure 3). The simulation results suggest that utilizing a shrinkage estimation approach to adjust the coefficients of the regression model can improve the performances of the original regression-based methods. Performance comparison between shrinkage LLS (shr_LLS) and LLS for different k values. Performance comparison between shrinkage SLLS (shr_SLLS) and SLLS for different K values. In real applications, different microarray data may have different missing rates to be imputed. It is informative to know how an imputation method performs for different missing rates. Therefore, we compared the performances of the shrinkage regression-based methods and the original regression-based methods on the microarray data with different missing rates (1%, 5%, 10%, 15% and 20%). Namely, for each of the six benchmark dataset, we randomly removed x% (x = 1, 5, 10, 15 or 20) entries of the complete matrix to generate a matrix with missing values, and then estimated the missing values using the shrinkage and the original regression-based methods. The same procedure was run for five independent rounds and the average NRMSE of these five simulations was used to compare the performances of different imputation methods. Note that the optimal k value used for each benchmark dataset was listed in Table 2. Figure 4 shows that the proposed shrinkage LLSimpute outperforms LLSimpute for all missing rates and all benchmark datasets. Figure 5 shows that the proposed shrinkage SLLSimpute outperforms SLLSimpute for all missing rates and all benchmark datasets. Figure 6 shows that the proposed shrinkage ILLSimpute outperforms ILLSimpute for all missing rates and all benchmark datasets. The simulation results suggest that utilizing a shrinkage estimation approach to adjust the coefficients of the regression model can improve the performances of the original regression-based methods. Performance comparison between shrinkage LLS (shr_LLS) and LLS for different missing rates. Performance comparison between shrinkage SLLS (shr_SLLS) and SLLS for different missing rates. Performance comparison between shrinkage ILLS (shr_ILLS) and ILLS for different missing rates. In real applications, different microarray data may contain different levels of noises. It is informative to know how an imputation method performs for different levels of noises inherent in the microarray data. Therefore, we compared the performances of the shrinkage regression-based methods and the original regression-based methods on the microarray data with different noise levels. For each of the six benchmark dataset, we added Gaussian noises with different levels into the data. The magnitudes of the noises were set in terms of the standard deviations ranging from 0 to 0.25 with a step size 0.05. In our numerical experiments, missing rate for each benchmark dataset was set to be 5% and the optimal k value used for each benchmark dataset was listed in Table 2. Namely, for each dataset (after adding Gaussian noises into the data), we randomly removed 5% entries of the complete matrix to generate a matrix with missing values, and then estimated the missing values using the shrinkage and the original regression-based methods. The same procedure was run for five independent rounds and the average NRMSE of these five simulations was used to compare the performance of different imputation methods. Figure 7 shows that the proposed shrinkage LLSimpute outperforms LLSimpute for all noise levels and all benchmark datasets. Figure 8 shows that the proposed shrinkage SLLSimpute outperforms SLLSimpute for all noise levels and all benchmark datasets. Figure 9 shows that the proposed shrinkage ILLSimpute outperforms ILLSimpute for all noise levels and all benchmark datasets. The simulation results suggest that utilizing a shrinkage estimation approach to adjust the coefficients of the regression model can improve the performances of the original regression-based methods. Performance comparison between shrinkage LLS (shr_LLS) and LLS for different noise levels. Performance comparison between shrinkage SLLS (shr_SLLS) and SLLS for different noise levels. Performance comparison between shrinkage ILLS (shr_ILLS) and ILLS for different noise levels. We have shown that our shrinkage regression-based methods perform better than the existing regression-based methods. Still, it would be interesting to know whether our shrinkage regression-based methods provide more accurate missing value imputation than the existing non-regression-based methods do. 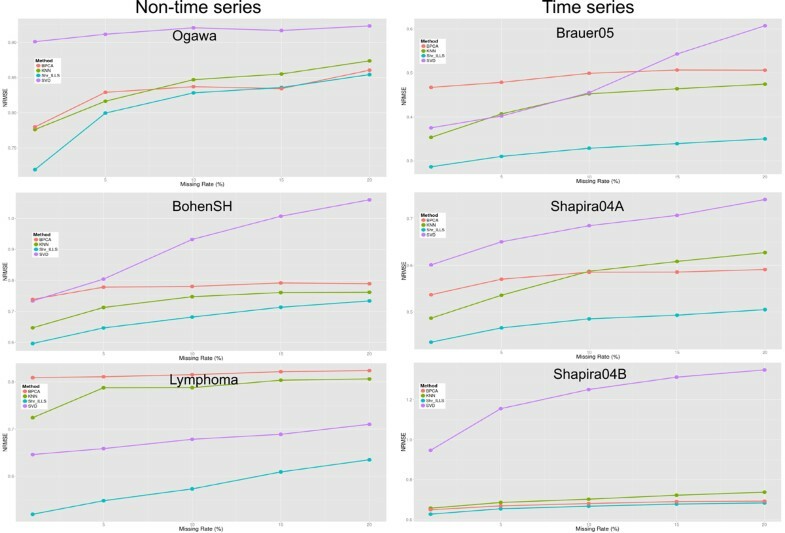 Therefore, we compared the performances of our shrinkage regression-based methods and three existing non-regression-based methods (kNNimpute , SVDimpute , and BPCA ) on the six benchmark microarray datasets. As shown in Figures 10, 11, 12, the proposed shrinkage regression-based methods outperform these three existing non-regression-based methods for almost all missing rates and all benchmark datasets. Taken together, our shrinkage regression-based methods are competitive alternatives to the existing methods for microarray missing value imputation. Performance comparison between shrinkage LLS (shr_LLS) and three non-regression-based methods for different missing rates. Performance comparison between shrinkage SLLS (shr_SLLS) and three non-regression-based methods for different missing rates. Performance comparison between shrinkage ILLS (shr_ILLS) and three non-regression-based methods for different missing rates. Imputation of missing values is a very important aspect of microarray data analyses because most of downstream analyses require a complete dataset. Therefore, exploring accurate and efficient methods for estimating missing values has become an essential issue. In this study, regression-based methods associated with a shrinkage estimation approach are proposed to estimate missing values in the microarray data. Our methods take the advantage of the correlation structure existing in the microarray data and select similar genes for the target gene by Pearson correlation coefficients. Besides, our methods incorporate the least squares principle, utilize a shrinkage estimation approach to adjust the coefficients of the regression model, and apply the new coefficients of the regression model to estimate missing values. Simulation results show that the proposed shrinkage regression-based methods provide more accurate missing value estimation for various types of datasets than the original regression-based methods do. Since our proposed methods can be applied to modify any kind of regression-based methods and can provide accurate missing value estimation, they are competitive alternatives to the existing regression-based methods. This study was supported by the National Cheng Kung University and Taiwan National Science Council NSC 99-2628-B-006-015-MY3 and NSC 101-2118-M-009-006-MY2. The full funding for the publication fee came from Taiwan National Science Council and College of Electrical Engineering and Computer Science, National Cheng Kung University. WSW conceived the research topic and provided essential guidance. HW developed the alogirthm. CCC did all the simulations. HW, CCC, YCW, and WSW wrote the manuscript. All authors have read and approved the final manuscript.